If you're looking for thrills and adventure on your vacation, make Jet Skiing off Gulf Shores and Orange Beach one of your first choices. 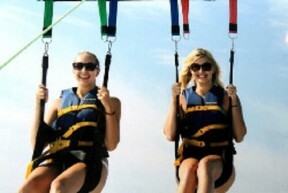 Nothing beats a day of freedom on the Gulf of Mexico with the wind on your face and the sea splash all around you. You can gently glide away from all your worries or get your adrenaline fix with a fast-paced romp through the waves when you rent a Jet Ski or WaveRunner. Book Tours & Activities Now! 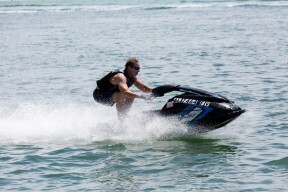 With a variety of Jet Ski and WaveRunner vendors located throughout Gulf Shores and Orange Beach, you have endless offers for your water fun and entertainment. 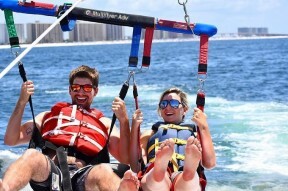 You can have your watercraft rental for as short as one hour or up to 8 hours, allowing you to explore all the beautiful turquoise waters of Orange Beach, Gulf Shores and Fort Morgan. The friendly and courteous staff at these locations will be more than happy to set you up for a safe and enjoyable adventure. 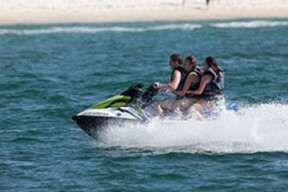 The Intercoastal Waterways have many wonderful experiences in store for a Jet Ski rider in Gulf Shores & Orange Beach. 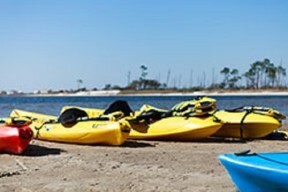 Gulf Shores' section of the Alabama Intercoastal Waterways spans from Perdido and Dauphin Island. While on your Jet Ski adventure, feel free to maneuver your watercraft safely around these islands while you explore their natural beauty, wildlife and history. There truly is nothing more magnificent than exploring these natural jewels that exist in the sparkling waters of the Gulf and Orange Beach. 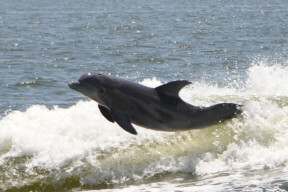 If you want to experience the marine wildlife from your Jet Ski or WaveRunner, the Intercoastal Waterway holds some of nature's most beautiful creatures in their natural environment. You will marvel at the graceful beauty of the stingrays and enjoy the frolicking play of the bottlenose dolphin. You may even get the opportunity to see the occasional shark. There is no better way to experience these beautiful creatures than on your own personal Jet Ski adventure. 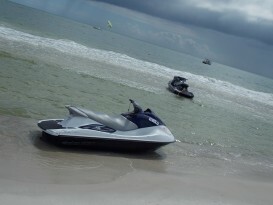 Want to whip through the waves by yourself and get an adrenaline rush? 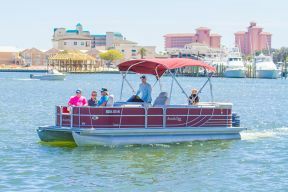 Or do you want to take a memorable meander along the Intercoastal Waterway with your children or grandchildren aboard? With a Gulf Shores or Orange Beach Jet Ski rental, you can choose to ride on a solo adventure or put as many as three family members on the same Jet Ski. With so many options to choose from, a Gulf Shores Jet Ski rental will surely give you the time of your life that everyone will remember forever.